Sweden received the highest number of unaccompanied minors in Europe in 2015. Continuously rated as Europe’s most pro-immigration population, Swedes should be easy for young newcomers to mingle with. Our case study, however, shows the truth is not quite so simple. Sweden has had a long history of welcoming migrants. Many of the newcomers with a foreign background however have trouble finding their place in Swedish society. The suburbs of Stockholm face high levels of unemployment, limited economic means and the absence of public spaces to socialise in. All this has a considerable influence on the wellbeing of residents, and youth in particular, in Sweden’s urban neighbourhoods. The EU Youth Strategy’s (2010-2018) key aim is social inclusion of all young people, including those from a migrant background. From 2016 to 2018, the focus is especially on migrant youth to be equally included in society and have the same opportunities as other youths. In 2015, Sweden, received over 35.000 unaccompanied minors, making them the country receiving the highest number in all of Europe. 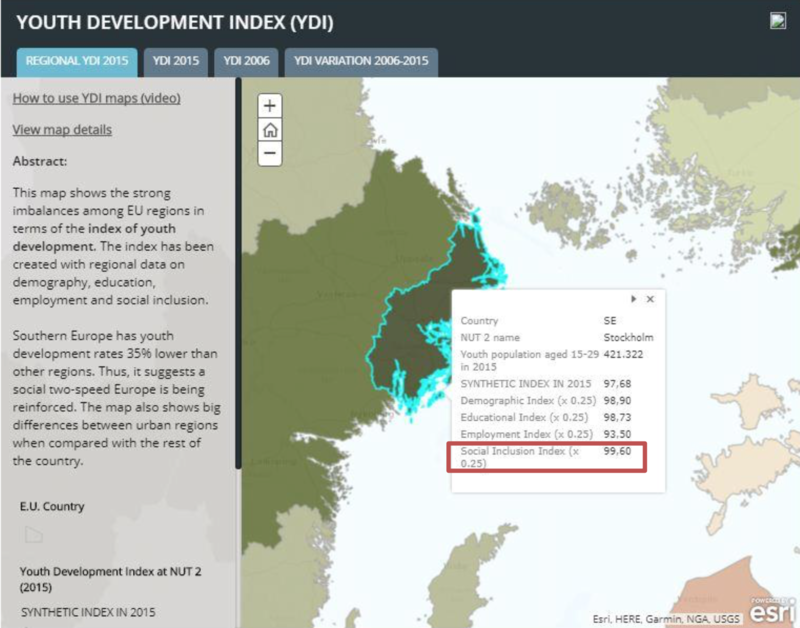 YouthMetre’s data shows that Stockholm County scores 99.60 on the Social Inclusion Index (which is part of the Youth Development Index). However, in terms of migrant youth the number does not show the whole truth. The reality for these youth are different, and it is an issue that we need to tackle to make the living and social inclusion easier for our new youth. Overall, Sweden scores high on all the indexes and is – judging by the numbers – a good country to grow up in and to take part in society. Repeated studies also show that Swedes are the most pro-immigration and pro-immigrant people in Europe. One could hope that these attitudes would translate into real behaviour. So far, however, they have not done so. The suburbs are in trouble and when looking at them you cannot say that Sweden is an integrated country. There is an “us” and “them” society. In the mainly immigrant Stockholm suburb of Rinkeby, close to 40 percent of the working population is jobless or outside education. Almost a third of those leaving secondary school do not have the required grades to go onto high school. It can be a space that can be open two-three times a week during the afternoon, in which youth can work at a café, making money for the rent etc. One of the “good practice” in the YouthMetre, is the project FETE: United Civil Society through Inclusion and Empowerment of Young Immigrants. The aim of the project is to give first generation immigrants the opportunity to gain and improve work experience and soft skills, take ownership and work on small scale projects beneficial for local communities in the partner countries. The project also aims to start a mentoring programme for continuous assistance for the young immigrants. I believe this could be a great model and good practice to look to when dealing with social inclusion in the suburbs of Stockholm. Botkyrka is one of the most diverse parishes in the Stockholm Region. 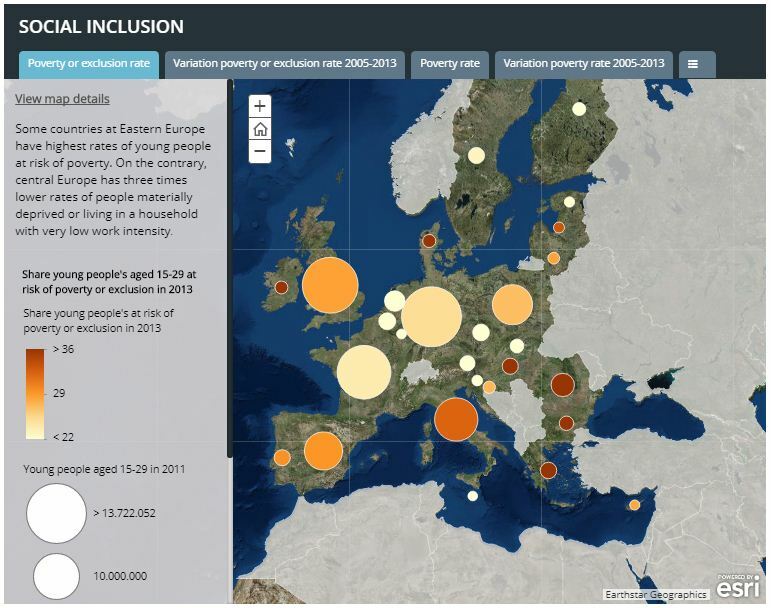 Recognizing the poverty and social exclusion challenges that it faced, Botkyrka Municipality has embarked on a wide-reaching and cross-sector strategy that centres on the well-being of the people who live in Botkyrka and celebrates their differences. Botkyrka is the first municipality in Sweden to promote interculturalism, an approach that respects different cultures and seeks to harness the strengths that these many different backgrounds offer. Rinkeby and other troubled suburbs in Stockholm could do a lot better when it comes to social inclusion of young immigrants! Letting them feel ownership and be involved in decision making processes that affect their lives and community would give them the trust and inclusion we need in today’s suburbs.